This simple tutorial will show you how to disable the mouse-over tooltip messages in Ubuntu 13.04 Raring and Ubuntu 13.10 Saucy using CCSM. It’s easy to do it using the CompizConfig Settings Manager by setting totally transparent tooltips. So that you can see them. NOTE: This method won’t work for the tooltips for Unity Launcher. To get started, install CCSM in Ubuntu Software Center. You don’t have to do something special, just search for and install CompizConfig Settings Manager. Then you can open it from Unity Dash. Open CCSM, click on ‘Opacity, Brightness and Saturation’ to go to its configuration page. 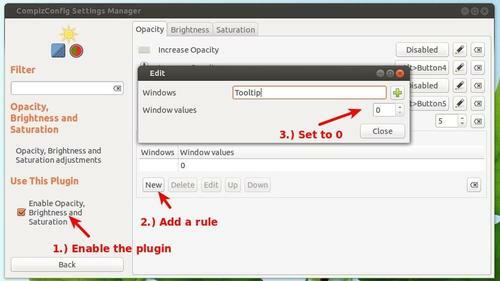 Then enable this plugin, click new to add a rule, type in Tooltip and set the value to 0 and finally close it. That’s it. To restore, just remove the rule in the plugin’s configuration page. Enjoy!